Are you ready to kick-start your Startup? Have a look at this smart Startup Starter Kit! We provide a Complete Startup Starter Kit to help you with the first important steps: from preparation, development stage, recruitment and to the first sales, accounting, review, and evaluations. This Startup Starter Kit is based on 40+ document templates that were requested and made by many other early-stage companies. It's created to support new Starter to meet their needs! Whether they need to incorporate, grow, or maintain their startup, these documents are all truly useful and will professionalize the way you are developing your company. Obviously, the alternative is to work with lawyers or legal professionals. However, they typically charge around $5,000 to make the documents, and it can take two or more weeks to prepare them. This Startup Starter Kit is a compilation of the most important business, legal, HR, Finance and marketing documents to help early-stage startups with all things that are crucial and important! 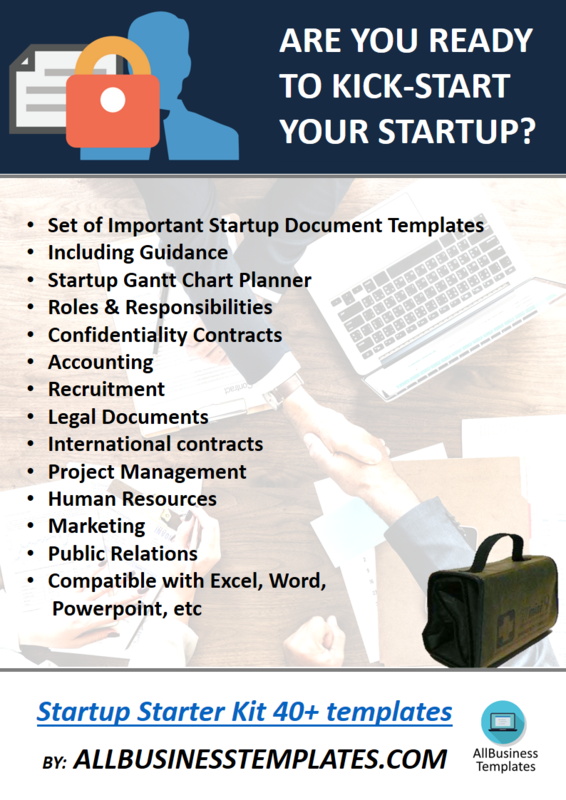 Check this 'Free Startup Must-have' Gantt Chart Planning that contains all the steps to take to make your Startup a success, including the relevant Startup Document Templates that are in this kit for each step to take. For an overview of important Startup Templates that will make you grow faster, click here: Complete Startup Starter Kit. Download this kit with 40+ startup document templates!